MASKerade: SugarPea Designs Light Bulb Moment (Muse 235) - Happy Howl-oween! SugarPea Designs Light Bulb Moment (Muse 235) - Happy Howl-oween! wonderfully colorful Ardyth, and a fab take on the muse. The card made me smile - Thank you. 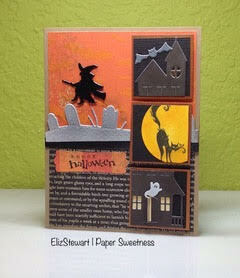 That's a very nice Halloween card ! I love the overlapping squares. Love the overlapping colored squares. Fun card. I know you don't want any votes since you're a DT member; however, I had to come here and tell you how fabulous this card is!! I love your take on the inspiration piece - so fresh and fun. The overlapping squares in the BG are genius! !